Kong: Skull Island is a 2017 American monster movie directed by Jordan Vogt-Roberts and written by Dan Gilroy, Max Borenstein, and Derek Connolly from a story by John Gatins. 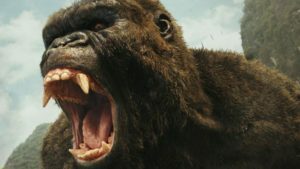 The movie is a reboot of the King Kong franchise, a prequel to Godzilla, and serves as the second movie in Legendary’s MonsterVerse. Take a look below for 30 more interesting and fascinating facts about Kong: Skull Island. 1. The movie stars an ensemble cast consisting of Tom Hiddleston, Samuel L. Jackson, John Goodman, Brie Larson, Jing Tian, Toby Kebbell, John Ortiz, Corey Hawkins, Jason Mitchell, Shea Whigham, Thomas Mann, Terry Notary and John C. Reilly. 2. 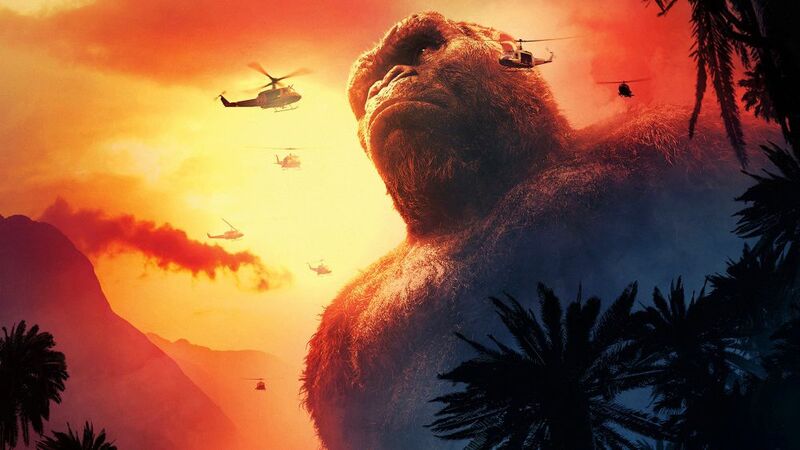 Set in 1973, the movie follows a team of scientists and a U.S. Army unit recently withdrawn from the Vietnam War who travel to an uncharted island in the Pacific and encounter terrifying creatures and the mighty King Kong. 3. The movie was a critical and commercial success, grossing over $566 million worldwide against its $185 million budget. 4. The movie received a nomination for Best Visual Effects at the 90th Academy Awards. 5. Samuel L. Jackson stated on a talk show that throughout the filming, he and his co-stars had no concrete idea of just how big King Kong was supposed to be, since whenever they asked, they kept getting conflicting answers. 6. At 104 feet, King Kong from Kong: Skull Island is the biggest out of all the American versions. 7. Sets were built at Kualoa Ranch, Hawaii, near the same filming locations as Jurassic World. 9. The poster for the IMAX release is an homage to the iconic poster for Apocalypse Now. 10. Michael Keaton and J.K. Simmons were originally attached to the movie, but both had to drop out due to scheduling conflicts. John Goodman took over Keaton’s role, while Samuel L. Jackson replaced Simmons. 11. Director Jordan Vogt-Roberts admitted that he was strongly influenced by video games from his childhood. That’s why the movie contains many point of view shots of guns being fires, like in a first person shooting game, and the shot of a helicopter making 360 degree spins toward the ground, which was inspired by a similar scene from a Resident Evil game. 12. At the premiere in Vietnam, the 16 foot display model statue of King Kong was engulfed in flames, which was caused by the models of smaller volcanoes surrounding the statue. The fire was extinguished in 15 minutes, and no one was hurt. 13. The Mother Longlegs spider could be an homage to the giant spider with crab claws that was cut from the 1933 movie King Kong. Also, the Skull Crawlers could be an homage to the two legged lizard that climbs up the side of the mountain in the original Kong movie. 14. The Vietnam National Administration of Tourism has proposed that Jordan Vogt-Roberts be the Vietnam Tourism Ambassador for a three year term. 15. In September 2015, Legendary Pictures moved the movie from Universal Pictures to Warner Brothers. 16. 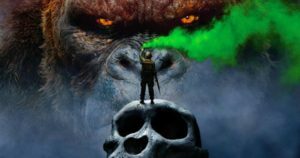 Actor and stuntman Terry Notary motion captures an ape in both Kong: Skull Island and the Planet of the Apes series, where he plays Rocket. 17. The Sker Buffalo resembles a larger version of a yak but its horns resemble moose antlers and it bears close similarities to Cape Buffalo and the Philippines Water Buffalo. 19. The psychovultures were originally based on stingrays. 20. 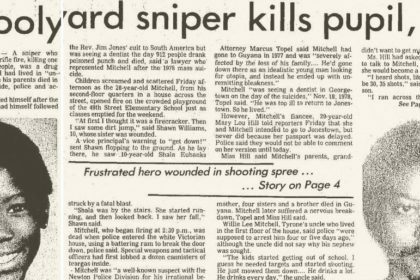 In the novelization, it’s revealed that Conrad’s cynical demeanor stems from an incident where he failed to save a kidnapped seven year old girl named Jenny, who was killed by a sniper along with two of the five men under his command. 21. Will Brittain portrays both young Hank Marlow and his adult son. 22. 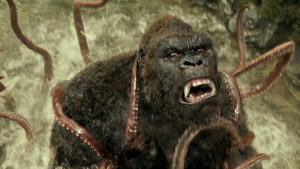 In April 2016, artist Joe DeVito sued the producers of the movie for using elements of his Skull Island universe, which he claimed he created and the producers used without his permission or compensating him. 24. 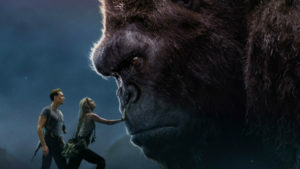 Kong combines features of early hominids, the mythical Bigfoot, and perhaps some aspects of the Gargantuas and Gigantopithecus, as opposed to being a more realistic gorilla as seen in the 2005 movie, King Kong. 25. Despite its name, the Spore Mantis doesn’t resemble an actual mantis and instead looks more like a stick insect. It’s possible that the name is a reference to Kamacuras. 26. The Skull Crawlers combine features of snakes, lizards and mosasaurs, all of which are members of the reptile order Squamata. 27. The Skull Crawlers don’t appear to have the ability to digest bone, as one is seen vomiting a human skull in the boneyard, which is similar to some species of snake that eat eggs. 28. The director has said that the inspiration used for the design of the Skull Crawlers came from the Pokemon Cubone. 29. The roar of the Skull Crawler is very high in tone, possessing a raspy quality with a hiss and growl mixed in between. According to sound designer Al Nelson, the Skull Crawler roar was inspired by the pained squeal of a dying rabbit as well as the sounds of sea lions and squirrels. 30. 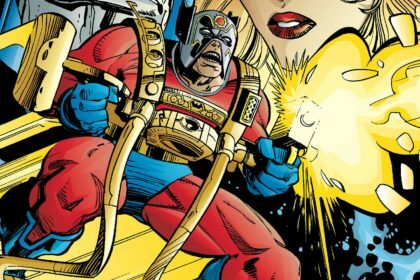 The name Conrad and Marlow are a reference to the novel “Heart of Darkness,” written by Joseph Conrad, featuring a main character named Marlow. The novel was also the inspiration for the movie Apocalypse Now.